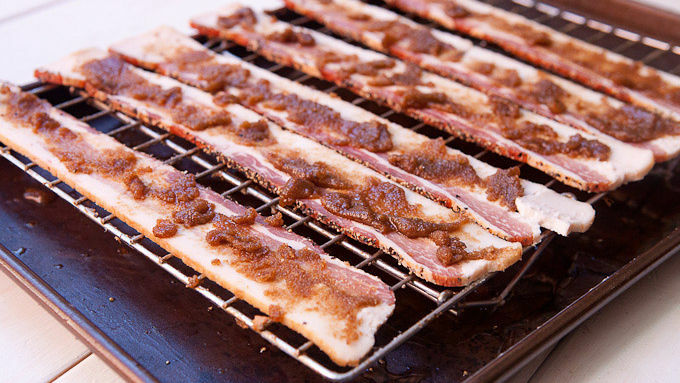 Lay out bacon on a baking sheet. Stir together brown sugar and maple syrup and top bacon strips with sugar mixture. 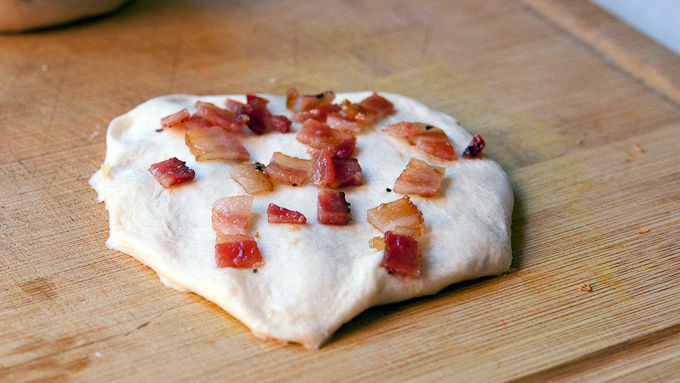 Place the bacon in a cold oven and heat oven to 350°F. Let bake for 20 minutes until bacon is very crispy. Remove bacon and chop roughly. Working with one biscuit at a time, roll it out into a flat round and sprinkle a small handful of crispy bacon on top, being sure to reserve some bacon bits to garnish the iced donuts at the end. Fold the biscuit over and reshape it into a round. 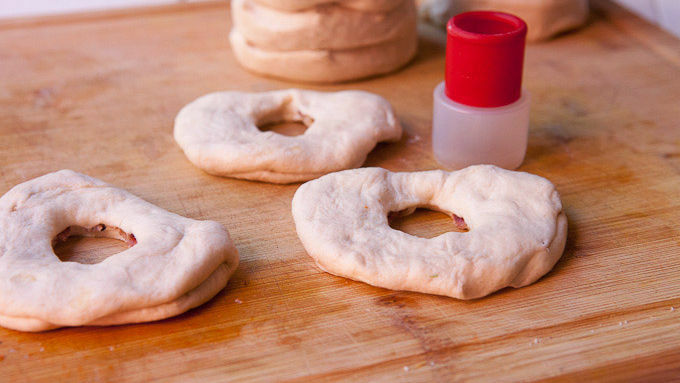 Use a small cutter to cut a round hole out of the center of the donut. Repeat, shaping all the donuts. If the dough gets really sticky, flour the donuts lightly. Preheat the vegetable oil to 325°F in a cast iron skillet or other large pan. 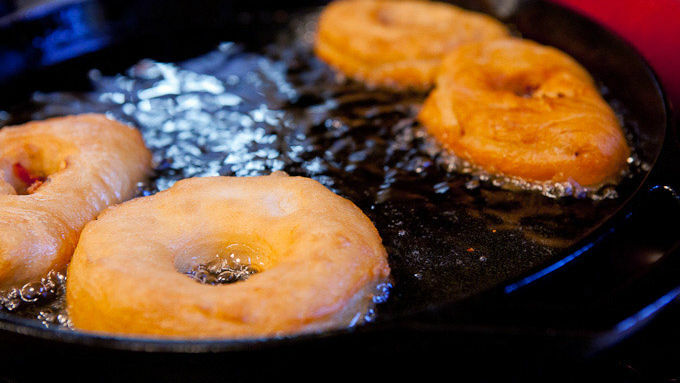 Once oil is hot, add donuts in batches and fry for 2-3 minutes per side until they are golden brown. Remove donuts and let them drain on a paper towel. For glaze, whisk together powdered sugar, milk, and maple syrup. 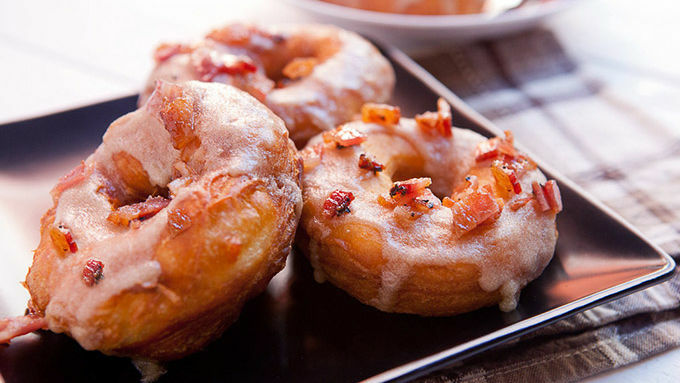 Drizzle donuts with glaze and top with the reserved bacon. Serve while warm. Easy homemade maple donuts with bits of crispy bacon inside and on top are fun to make and fun to serve! There’s a trend that’s been floating around for a few years now – fancy donuts. The trend goes something like this: Put some cereal or a few bacon bits on a donut and sell it for $8. Great business idea, but hard on the wallet! You can easily replicate these fancy-pants donuts at home by making some candied bacon (one of my favorite treats) and topping it over fried biscuit dough, which gets pretty close to a donut without the extra work of making an enriched dough. First, let’s talk bacon. I always like to bake my bacon so it gets really crispy. To candy it, just mash together some brown sugar and maple syrup and coat the bacon in that mixture. As the bacon cooks, the sugar will cook into the bacon and caramelize, leaving you with crispy bacon that has a light sugary candy on it. It’s probably the most addictive thing ever. Just try not to eat it all before you can use it in the donuts! I don’t mind making actual dough for these, but if you’re looking for a shortcut, just use biscuit dough. It has just the right amount of sweetness and will puff up nicely when fried. Now you can skip the lines at the fancy donut shops and make this version at home!